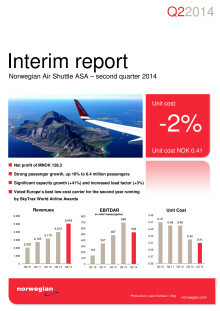 The second quarter figures also reflect Norwegian’s growth strategy and the company’s goal to fill all its new seats. Despite significant costs related to the start-up of the long-haul operation and higher costs due to the weak Norwegian currency, the unit cost (CASK) is down, strengthening Norwegian’s competitive advantage further. 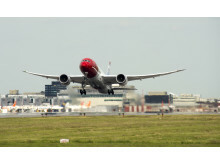 Over the past year, Norwegian has introduced seven Dreamliner aircraft to its long-haul operation. The total revenue in the second quarter was over 5 BNOK, up 26 percent from the same quarter last year. The pre-tax result (EBT) was -137 MNOK. 6.4 million passengers chose to travel with Norwegian during the second quarter, which is an increase of 16 percent and almost 900 000 passengers more than the same period last year. 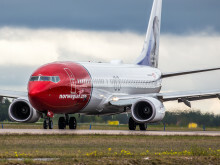 The company’s traffic growth (RPK) was considerably higher at 46 percent, which reflects that each of Norwegian’s passengers on average flies significantly longer than they did a year ago. Norwegian realized a strong production growth (ASK) of 41 percent. The growth is, naturally, stronger in new markets. Despite Norwegian’s strong capacity growth, the company is still filling its seats. The load factor in this quarter was 80 percent, up three percentage points from the same quarter last year, which is record high for a second quarter. 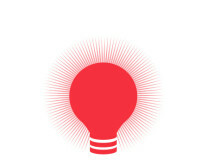 “This quarter, we see clear results of the company’s strategy. Over the past year, we have established a long-haul operation and we have opened several new bases in Europe. More than half of our 417 routes are currently operated outside Norway, which illustrates a significant international expansion over the past year. At the same time, we have managed to cut costs, which is essential in such a competitive, global business as the aviation industry. We have, however, had significant, one-off expenses. Both wet lease of aircraft and the strike from labour union Parat has affected the result significantly. There is also a high competitive pressure, particularly in the Scandinavian market,” said Norwegian’s CEO Bjørn Kjos. “The most important evidence of customer satisfaction is the fact that more and more people choose to fly with Norwegian,” said Bjørn Kjos. Norwegian Air Shuttle ASA, commercially branded “Norwegian”, is a low-cost airline listed on the Oslo Stock Exchange. Norwegian is the second largest airline in Scandinavia and third largest low cost carrier in Europe. More than 20 million passengers fly on its network per year. Norwegian has a route portfolio that stretches across Europe into North Africa and the Middle East, as well as long-haul flights to the US and Southeast Asia. The company has a total of 417 routes to 126 destinations and employs approximately 4,500 people in Norway, Sweden, Denmark, Finland, Estonia, UK, Spain and Thailand. The company has 258 undelivered aircraft on firm order. Norwegian was founded in 1993 and its headquarter is in Fornebu, Norway. In 2013, Norwegian was voted Europe’s best low-cost carrier of the year by the renowned SkyTrax World Airline Awards. Norwegian offers better leg room than most competitors, in-flight WiFi, world-class punctuality and a fleet of 96 aircraft with an average age of only 4.8 years.